The body is constantly in need of detoxification — from both pollutants and natural processes that create wastes (metabolic waste). 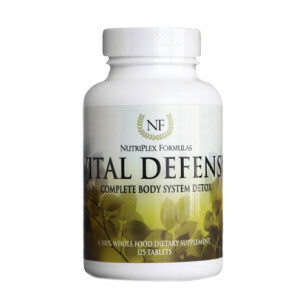 Vital Defense offers cleansing foods and herbs to help the body recover faster. Excellent for detox diets, liver support, wellness, diets that include artificial ingredients and nonorganic foods & more! Olive Leaf Powder,* Beet Root Powder,* Wildcrafted Pau d’Arco Bark Powder, Milk Thistle Seed Powder,* Dandelion Leaf Powder,* Wildcrafted Black Radish Root Powder, Turmeric Root Powder* and Liver (bovine, dessicated, defatted). Inactive Ingredients: Microcrystalline Cellulose, Acacia Gum Powder, Croscarmellose Sodium and Silicon Dioxide. 3 capsules daily, or as directed by a healthcare practitioner. Not intended for pregnant or lactating women without consent of a physician.